Hi! Welcome to my latest endeavor blogging. I am so excited about this blog. I have so much information I want to share with you about purchasing and selling your home. What better way than to put the information in a blog. 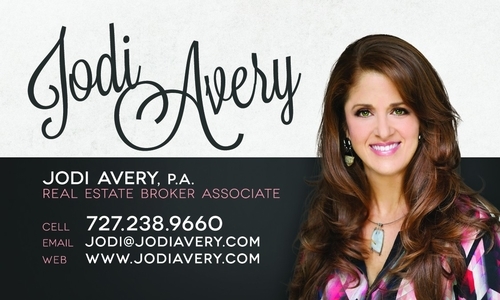 I plan on giving you information you can use with tips and ideas to help you, including my top 25 restaurants in the area and Jodi’s A-list. First of all, I would like to tell you a little bit about myself. I am a Real Estate Agent. I specialize in representing both Buyers and Sellers in Clearwater, Safety Harbor, Oldsmar, Dunedin, Palm Harbor, Tarpon Springs, New Port Richey, and Trinity. I am a mother of four wonderful children. I grew up in the Tampa Bay area and attended Countryside High School. I earned my Bachelor’s Degree in Business and Marketing from the University of South Florida. I started in Real Estate in 1993 and received my Brokers license in 1994. I am a member of the National Association of REALTORS, the Florida Association of REALTORS, and the Pinellas Realtor Organization. I am a designated certified distressed property expert (CDPE) and a designated certified investor agent specialist (CIAS). I am passionate about what I do and forward to utilizing my talents, gifts and skills to work with you and for you. Please enjoy and let me know what you think about my blog. I would love to have you comments.